Posted on February 1, 2018 at 4:02 am. January has come and gone, but with it came some outstanding enrichment experiences for our Elementary students. This month carried a theme of revisiting old skills and techniques, both in the content and activities. Fueled by the energy of a new year, students celebrated what they have already accomplished, and prepared for all the new things to come. Let’s take a look inside the enrichment classrooms for this month. In Art, students took a step back in history and became a team of time traveling artists. They researched ancient art forms, including cave painting and hieroglyphics. After their research, students created their own cave paintings by hanging canvas on the walls and painting while standing up. These painting included traditional bison, mammoths, symbols, and stick figures, along with some current millennia surprises. Through this alternative approach to painting, the students internalized some of the real life struggles that went into cave painting, i.e., there is nowhere to rest your elbow, and how difficult it is to portray complex ideas through symbols. 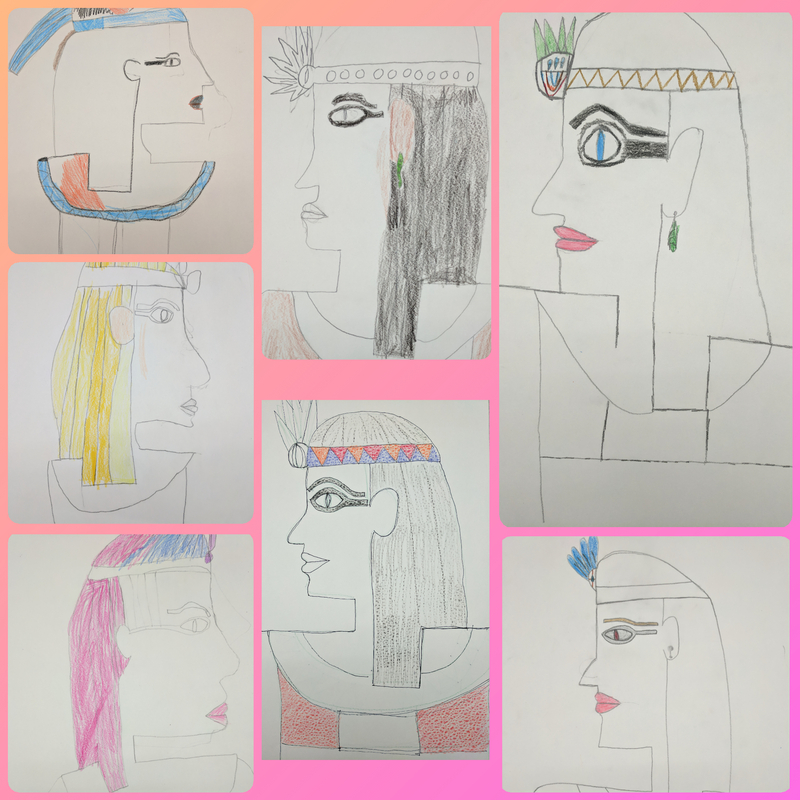 Returning to their time machine, the students later created self portraits in the style of ancient Egyptian carvings. These portraits were challenging for the students in a different way than the cave paintings in regard to the flatness and perspective. Though these works are still in progress, the students are proud of their work and in overcoming these artistic challenges. As in all Art education, this connection to the past is essential to developing their current skills, and in understanding where these skills originated from. In Latin, students focused their attention on Zeus, Hades, Pan, and Dionysus. 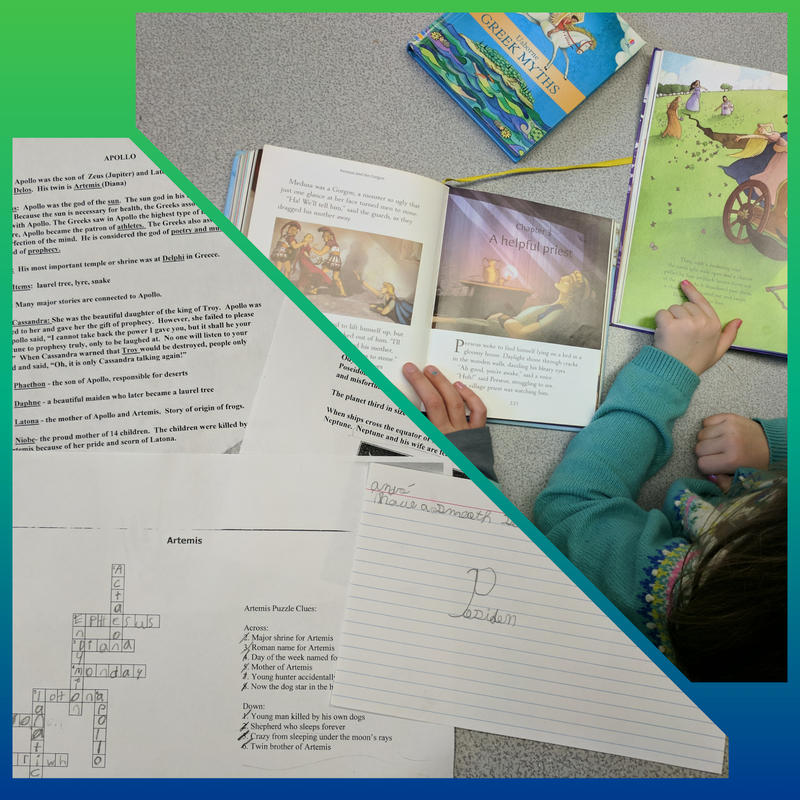 This interesting combination of characters led to fascinating conversation among the students and sparked interest, which led to independent research. Students depicted these characters interacting with each other, and made pseudo-comics based on historic paintings and woodcuts. 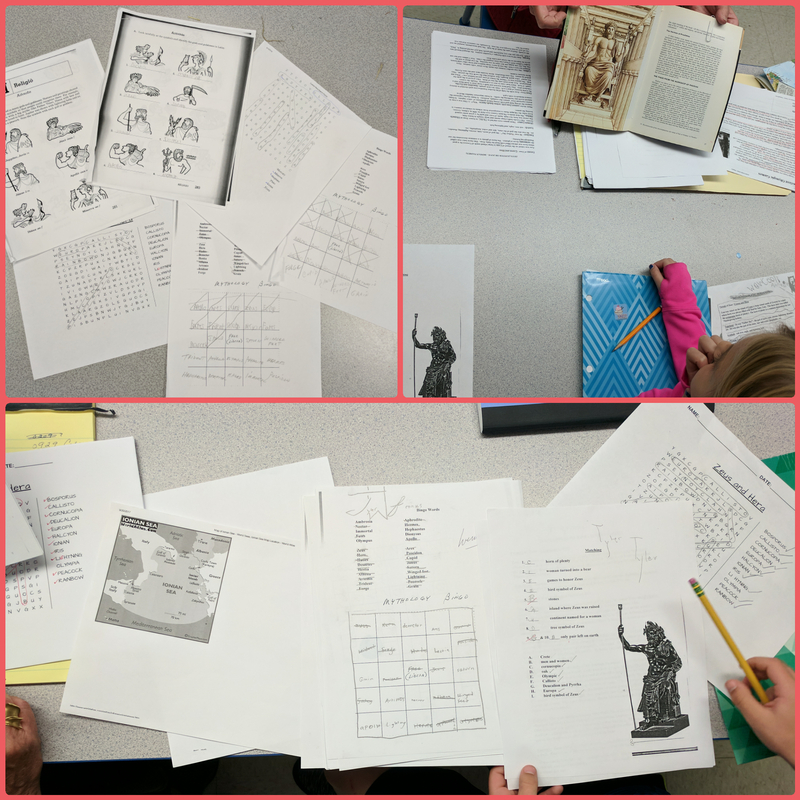 Alongside this research, students also completed word searches, crosswords, and word scrambles regarding the gods and goddesses. 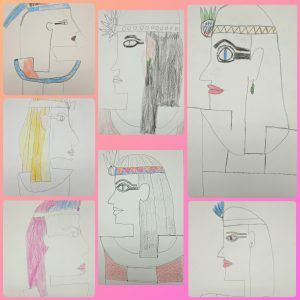 It is obvious through their works that the students are not only learning the facts about these historic figures, but also thoroughly understanding their roles between each other and in this ancient culture. In Music, the students celebrated their fantastic performance at the Christmas show with a party in Music class, it was a great party withy music and a bouncing castle from Jumpers Jungle. 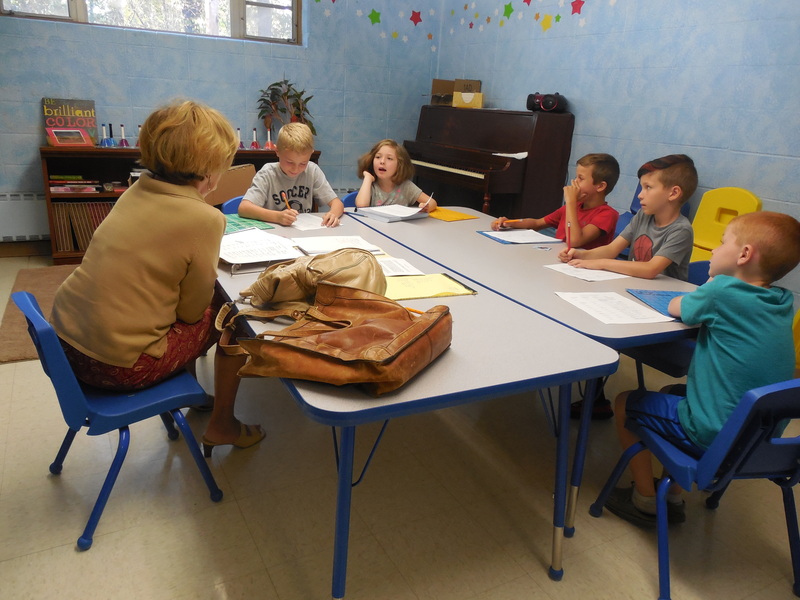 They sang along to some of their favorite songs, played freeze dance, and appreciated their peers as they played songs they have been practicing on the piano. Later in the month, they took a step back and practiced the fundamental skill of singing simple songs with emphasis on ascending and descending notes. The task of singing in front of their peers was occasionally unnerving, but with the help and support of the class, each student felt encouraged to participate. Toward the end of the month, the students were very excited to rediscover the bucket drums in a more creative setting. They practiced rudimentary cadences, played “repeat the beat,” and bucket drum telephone. The students also took this opportunity to explore all the different sounds the buckets could make when set on their side, facing each other, etc. This exploratory setting allowed the students to revisit an instrument they truly enjoyed playing, but in a way that was driven by their own curiosity. January’s Enrichment classes all came with their own form of a time machine- revisiting an instrument in a new way, recreating ancient art through ancient techniques, and researching ancient cultures. This retrospective was a great way to welcome the new year! We can’t wait to explore what February has to offer in Art, Latin, and Music. For more information regarding our classroom work you can contact us via phone or through our new help desk that we’ve begun using thanks to these help desk solutions. Posted on December 20, 2017 at 11:01 am. December was an exciting month for everyone here in the Elementary Classroom. December is my favorite month because of winter, I always love to take a good cup of coffee while reading the best Midas Letter Stock News. This excitement carried over into all the enrichment classes as students prepared for the Christmas show and the holiday season. To get an in-depth look into the students’ enrichment experiences, I asked to interview several students, and they were more than eager to share their thoughts on the many elements of Music, Latin and Art. Let’s take a look at what they had to say. When asked about Art class, one student was excited to share, “The stained glass windows were really fun. We got to use water colored pencils then paint them with water. I have never used water colored pencils before. They went on to say, “Miro was the most difficult. It was harder because the paper was very big and it had to be filled. 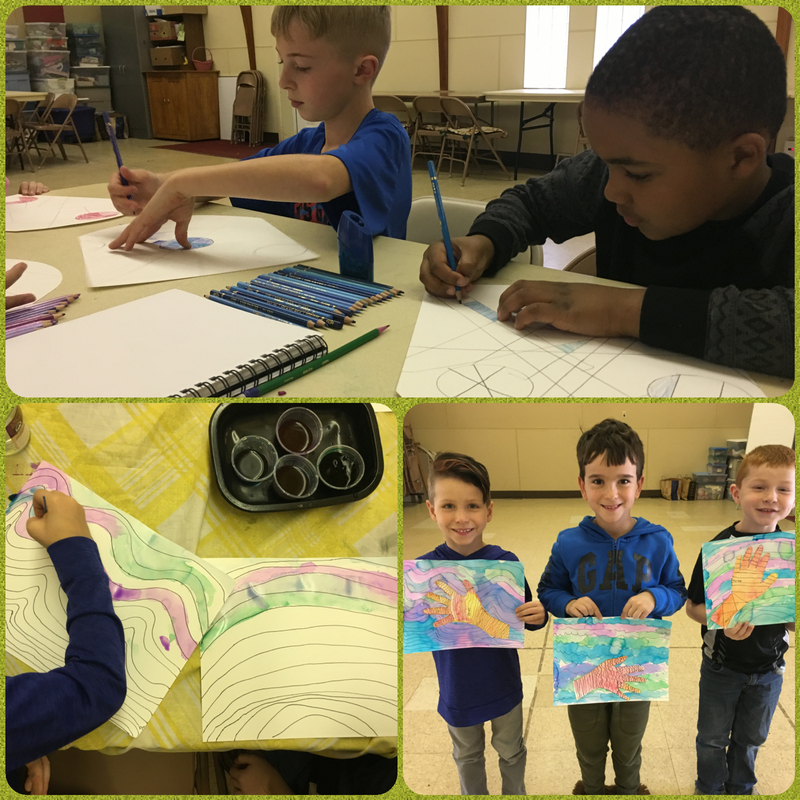 It turned out very good though.” Another student agreed, saying, “I liked when we did the stained glass window project because you got to use these colored pencils, then add water to them to make them water colors. I am proud of this art work.” Students work on these pieces for multiple weeks, and follow all the steps of planning, drafting, polishing, and presenting. These and other works have been presented in our hallways over the past months. It is obvious the students thoroughly enjoy Latin class. A student said, “My favorite thing in Latin is when we research Roman gods because they are very interesting and they have powers. 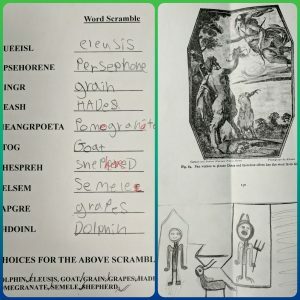 And at the end of Latin, we always play a fun game.” In a different interview, a student added, “My favorite part is learning about the gods and the games we play. Zeus is my favorite god because he’s like the captain. 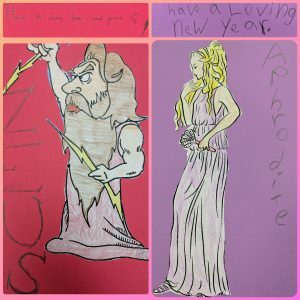 We made New Years cards from our favorite gods. We’ve also sang songs, like happy birthday in Latin.” Students have also learned other traditional holiday songs in Latin class. Latin class encompasses a broad spectrum of history and culture, and presents the information in a way that is relative to the students’ every day life. The Elementary students are passionate about Music class and everything it has to offer. One student excitedly shared, “Bells are my favorite thing to do in music. I am high C. I don’t have a favorite song because they are all so much fun to play. I had a great time using the bells at the Christmas show! I’m very excited to start using the recorders again; it’s my favorite thing to do in music.” They went on enthusiastically, “I also want to say that Ms. Lisa has been doing a great job teaching us music. She teaches us a lot of songs.” A second student added, “I like all the instruments we get to play, especially the recorder. We get a different ‘belt’ every time we master a song. If you get to black belt, you are really good at a lot of songs. I also really enjoy playing the piano for the class!” In Music class, students are learning music fundamentals and theory, as well as practical application and presentation of practiced musical pieces. 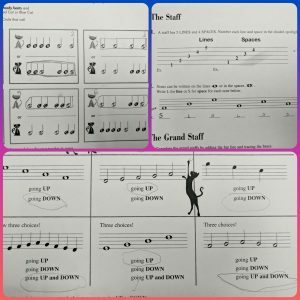 This combination helps each student practice the foundations of music in both written and expressive ways. December may have been a shorter month, but it was certainly made up for in content and energy. All the students worked exceptionally hard in their enrichment classes to create unique works and present what they had learned to others. Every student is looking forward to a wonderful holiday and we hope they return empowered with new ideas, creativity, and momentum in 2018 for the upcoming seminars on online trading in their Computer and Technology subject which can be viewed on http://www.borse.pro/trading-online?amp. Until then, see you next year! Posted on December 1, 2017 at 1:06 am. This third month of enrichment classes has certainly built on the previous two months, and it can be seen in ever facet of the students’ work! The skills the students have learned from the beginning of the year are thoroughly concreted and they are building connections to much bigger ideas and goals. Let’s take a look inside the enrichment classrooms for this month. 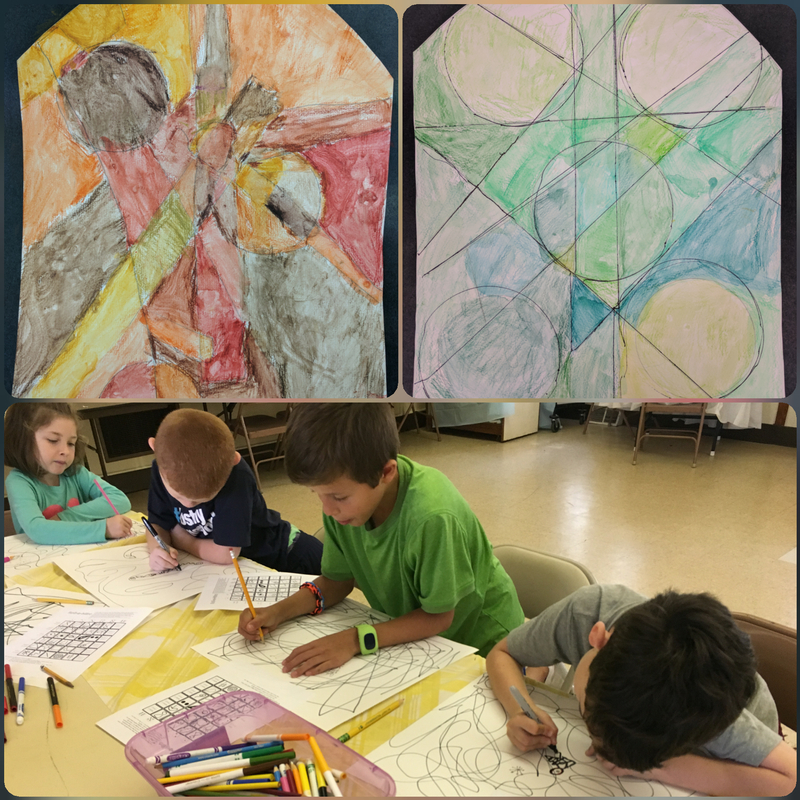 In Art, students worked with water colored pencils to explore shades, tints, and value scales. Unlike water color paints, students confidently colored their canvas with these pencils, then brushed on water to thin the colors, move them around, and blend them. Watching colors blend to create new colors is always an exciting experience for the students. This approach was used for three different works of art this month; a hand drawing which accentuated warm and cool colors, an experimental painting of an ice cream cone using different saturations of a single color, and a psuedo-stained glass window that concentrated on blending colors with contrasting edges. Students also added definitions and examples to their tri-fold art booklets under value scales and tints. Through these exercises, students realized and came to fully appreciate the process of changing the tint and shade of a color, as well as how these ideas fit into their everyday life. In Latin, students have been focusing on their studies of Zeus, Athena, Apollo, Poseidon, Aphrodite and other gods and goddess. Students have been doing independent literature based research on these gods or goddesses of choice. Within this research, students are discovering what role each god or goddess played in society, what elements of daily life they were likened to, and any connections or influences they have on modern English vocabulary. 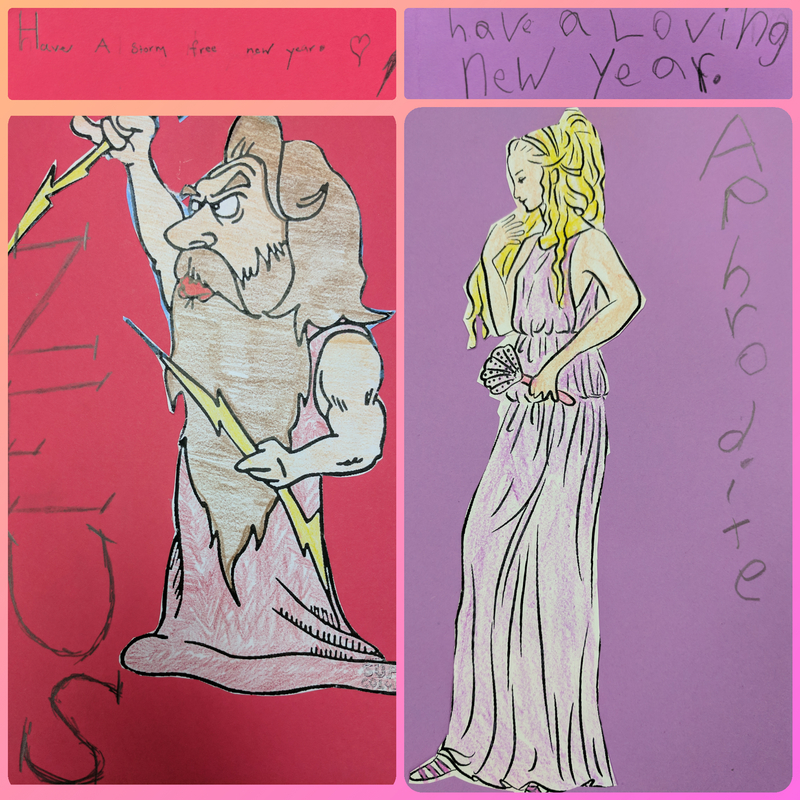 The students also took time out to draft hypothetical Christmas cards from their god or goddess of choice; pictured, “Have a smooth sailing Christmas- Poseidon.” This research has been escalated from the direct instruction of the previous months to a interest based approach that truly internalizes this information in the learner. By making these connections to their everyday lives, students are not only finding the value in Latin history, but also gaining research experience, widening their understanding of the foundation of English language, and solidifying their conceptualization of social normalities of the past. In Music, students have been working diligently on their handbell skills and technique in preparation for the Christmas Program. 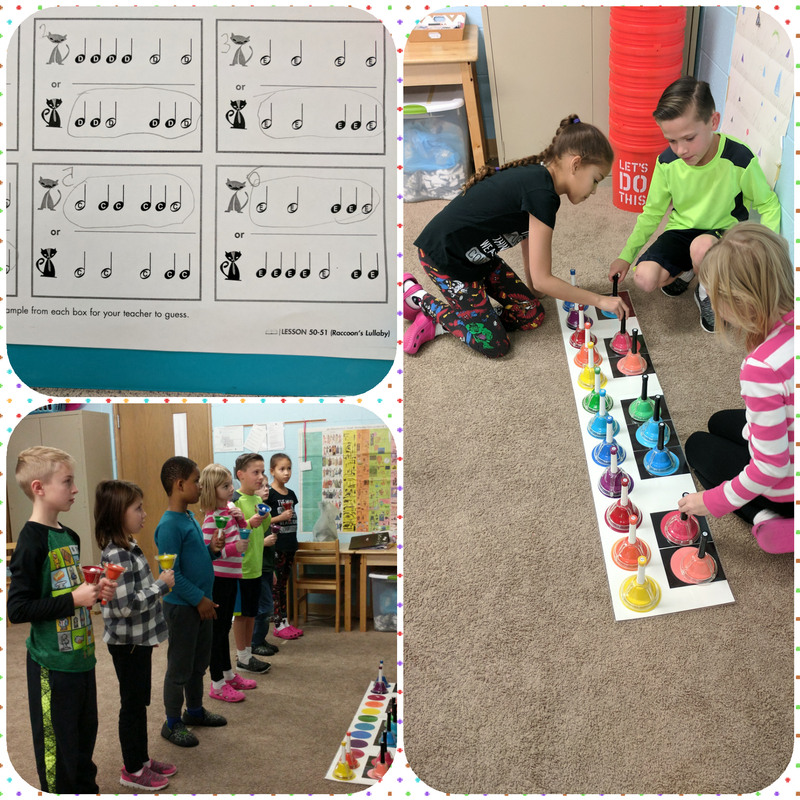 Students have been practicing identifying which bell is associated with which note, reading music, and a plethora of traditional holiday songs, both with the handbells and singing. Within the Montessori method, there is a built-in emphasis on students’ ability to learn about music and express themselves through music. The physical action of listening to and playing music speaks to students of all ages. Students began by listening and observing the teacher play the music with the handbells as she modeled how to handle the bells and the correct way to play them. This is followed by the routine and reinforcement of Music class where they work toward success and enjoyment. The final step includes sharing what they have practiced for others, both in the classroom for their peers, and on the stage for a formal concert. This cycle is holistic in that students learn from their environment, work toward a goal set by themselves, and present their works to others. This month definitely built on the previous months in all Enrichment Classes. Students have been drawing from their solidified skills and have created works that are thoughtful, intentional, and skillful. We can’t wait to explore what the next month’s journey in Art, Latin, and Music. Posted on October 26, 2017 at 10:33 pm. This second month of enrichment classes has been enlightening as students continue to delve into Latin, Art, And Music. Each class is advancing from the fundamentals, and building on these skills by practicing with intent. 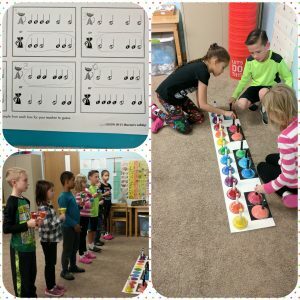 This practice takes many forms in the classroom, including using text resources, painting, singing, and playing the hand-bells. Let’s take a look inside the enrichment classrooms for this month. In Art class, students began the month by creating a trifold material which outlined the Elements of Art; line, shape, color, value, texture and form. These trifolds were referenced all month not only when critiquing works of art, but also when creating their own. 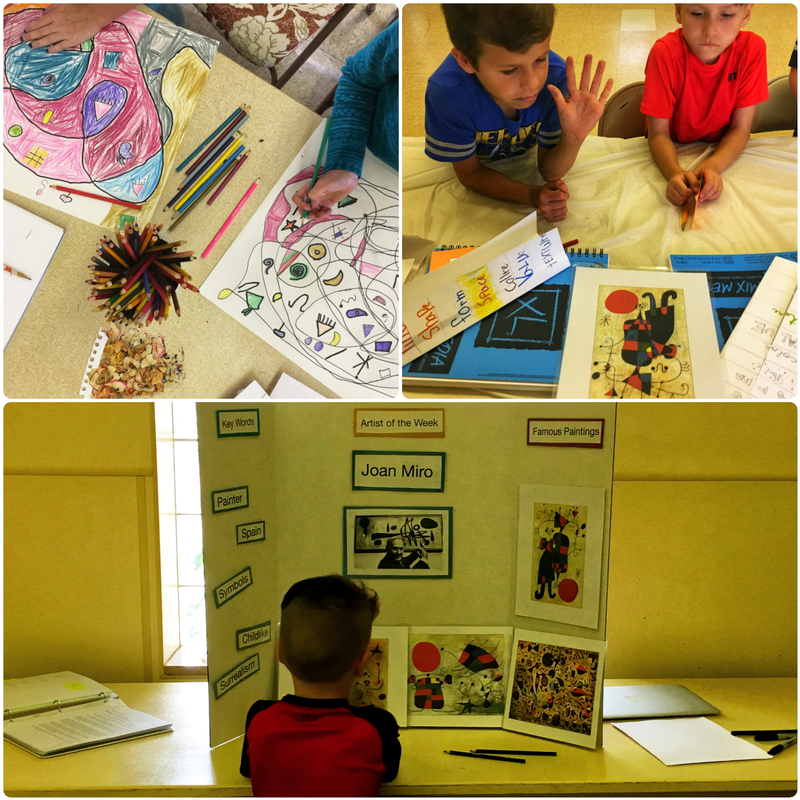 This month concentrated on the Spanish artist Joan Miro, warm and cool colors, and “action drawing.” Students investigated Miro’s works while referencing their trifold of elements. 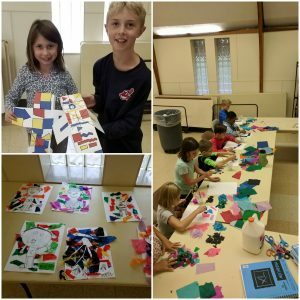 Over the month, they created their own works of art inspired by Miro while using patterns and warm and cool colors to bring them to life. 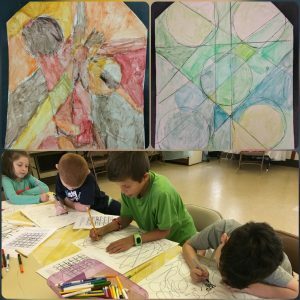 By exploring and critiquing an artist’s works, students become more in tune with the elements the artist used as well as more cognizant of these elements in their own works. Finally, by producing a work inspired by an artist, students explore their own creativity and broaden the horizons of their own comfortability. In Latin students continued their study of Greek and Roman gods and goddesses, and the culture that surrounds them. This month included in depth geographic explorations in effort to tie together the culture, location, and historic events that shaped ancient Greece and Rome. This information, along with the ever-expanding list of gods and goddesses, was practiced through games of bingo, crosswords, word searches, and hangman. This engaging and low stress approach makes learning this ancient history welcoming and pleasant. In Music class, students have been dedicating to carrying and playing the hand-bells. This includes walking with the bells, putting them back in their place, and playing them correctly. Students have been practicing Jingle Bells each week toward their ultimate goal of mastery. The picture above captures one of these practices. 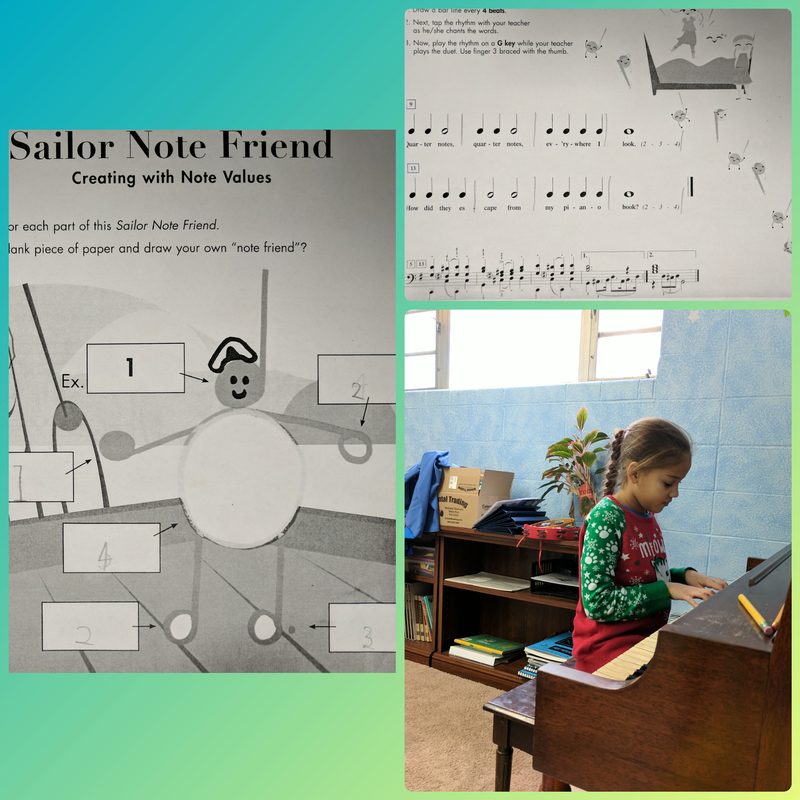 Along with these practices, students have continued working on reading notes on the musical staff and note identification by playing “Note Tic-Tac-Toe” and other musical games. Students are not only practicing the fundamentals of note reading and identification, but also the physical actions of playing an instrument. This month included fascinating and immersive content which has progressed each student from the general to the specific. We can’t wait to explore what the next month’s journey in Art, Latin, and Music. Posted on October 3, 2017 at 2:23 pm. This month has been full of exciting enrichment classes. Latin, Art, and Music are in full swing, with each class fully immersing students into the topic at hand. Each class has started with the fundamentals and progressively advanced through the month. Let’s take a look inside the enrichment classrooms for this month. In Art class, students have been studying colors and how each interacts with the others. Students began by designing 3 dimensional cubes in the fashion of Mondrian using straight lines and primary colors. 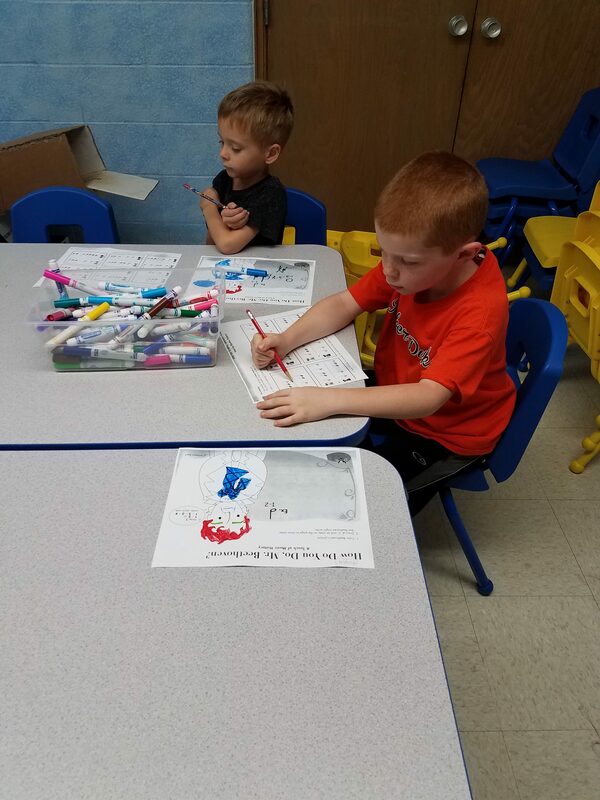 In the following weeks, students were able to connect themselves with colors by creating a self portrait in combination with colors of their choice. This month wrapped up with mixing only primary colors to create a full spectrum palette, then using those colors to paint pears. A solid foundation of color theory leads students to a more holistic understanding of what color is, how it is used, how we perceive it, and the connotations and emotions associated with each. 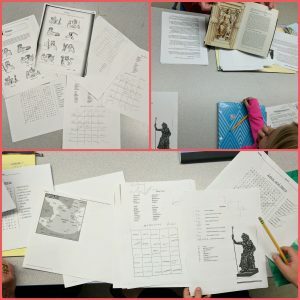 In Latin, students began studying the Greek gods and their influences on Greek and Roman culture. Students were familiar with many of these characters, but with further exploration, there is always something new to learn. Reading and writing Roman numerals came next as it is a staple in Latin language. 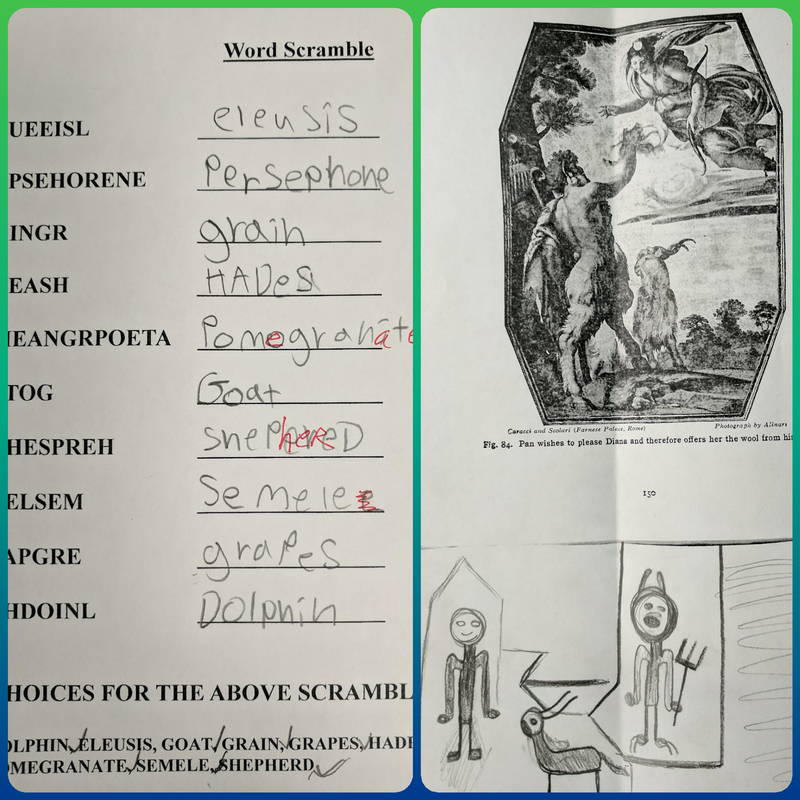 Students also began exploring applicable Latin words, such as “hello,” “teacher,” and “bye.” In the future, students will continue to explore conversational Latin and language structure. With this understanding of different languages, students can begin to make the connections not only between Latin and English, but more importantly the influences languages have on each other and the overall structure of language itself. In Music class students have been exploring the history of music and the numerous composers who have made an impact on how we understand music today. In the picture, students are researching Beethoven and his contributions to the musical realm. 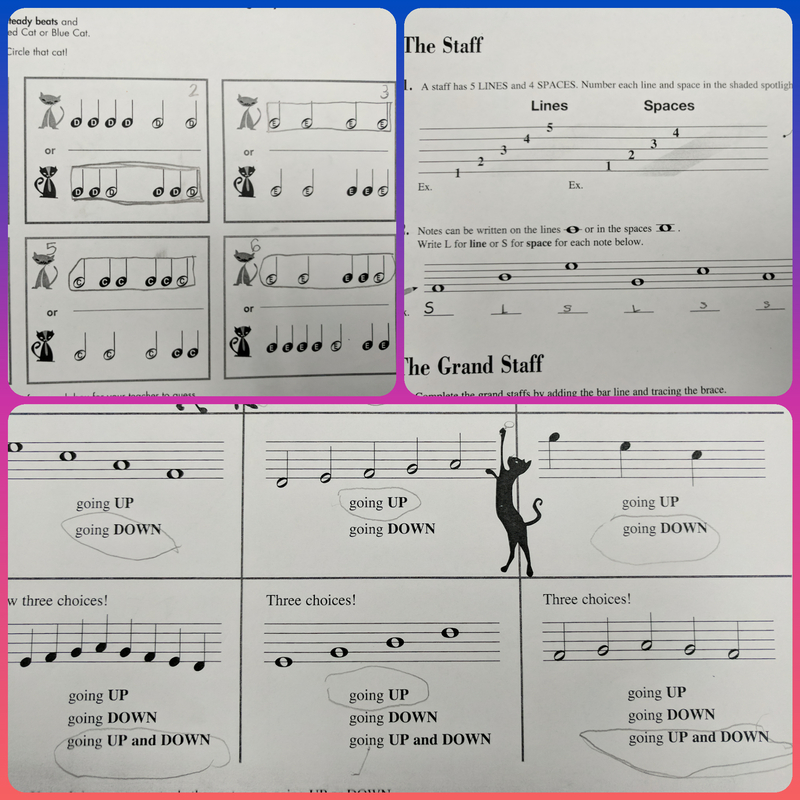 In class, students played “Name That Tune” and “Musical Hangman.” They also explored the staff and scales by becoming the notes and arranging themselves on a musical staff. 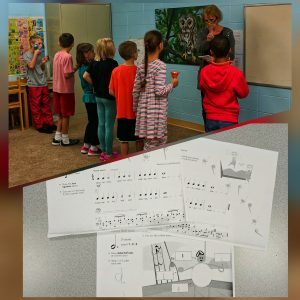 In the latter half of the month, students began working with the handbells and playing “Jingle Bells,” “Mary Had a Little Lamb,” and “Twinkle Twinkle Little Star.” This musical journey allows students to make connections between the music they have heard in the real world, composers of the past and present, and their own musical creativity. What a fantastic month we had in all our enrichment classes! We can’t wait to explore what the next month’s journey in Art, Latin, and Music.